Demonstrators has been protesting against ‘SOPA Ireland’ and the EU-wide ACTA legislation. ANTI-ACTA PROTESTERS gathered in Dublin today to demonstrate against proposed EU legislation which aims to tackle the trading of counterfeit goods and illegal file-sharing online. The European Commission says that the legislation – which Ireland has signed up to but which must come before the European Parliament later this year – will not create new intellectual property rights but will enforce existing ones. The dozens of protesters were also expressing their concerns over legislation proposed by junior minister Séan Sherlock regarding copyright protection online which has been dubbed ‘SOPA Ireland’ or ‘Irish SOPA’ in reference to similar legislation in the US which has been shelved. After a recent Dáil debate on the issue, Sherlock emphasised that he would not be changing the wording of the statutory instrument which critics fear will stifle internet freedom. Sherlock has rejected comparisons between the Irish and the US legislation. Instead, he says that the statutory instrument in Ireland is required to bring Ireland into compliance with existing EU directives on copyright protection. A Stop SOPA Ireland online petition has gathered over 80,100 signatures since it began on 26 January. 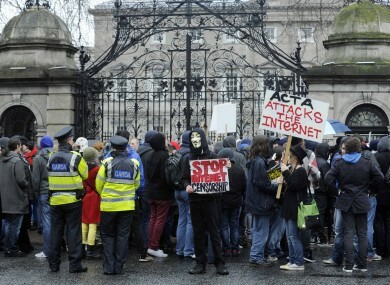 Email “In pictures: Anti-ACTA protesters march in Dublin”. Feedback on “In pictures: Anti-ACTA protesters march in Dublin”.